The Cattleman Road Bridge is a deck truss structure. However, the vegetation is so dense around the bridge that I had a hard time photographing the truss, which is some distance from the approaches. The photo on the east end (above) shows the concrete T beam approach to the bridge. The photo below (from the Historic 101 website) shows the deck truss section on the west side of the bridge. There are more photos of the bridge by Craig Philpott on the Bridgehunter website. 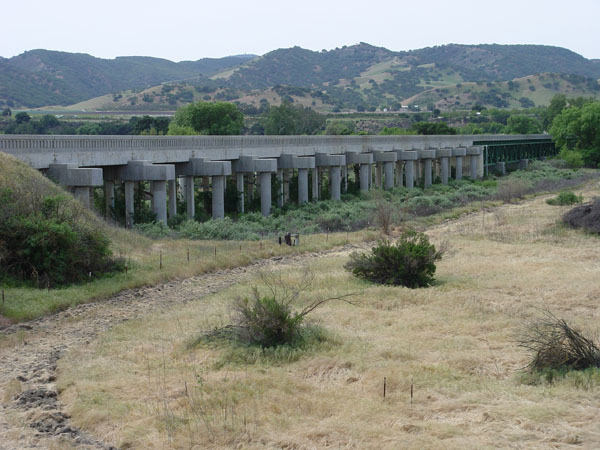 The Cattlemen Road Bridge (44C0101) is a 1654 ft long bridge across the Salinas River Floodplain. According to Craig Philpott the bridge's unusual appearance is due to a recent seismic retrofit that included a continuous barrier rail to hold the bridge together and restrain the movement on this long structure. Note the exterior pile shafts to restrain transverse displacement along with the shear keys on top of the extended bent caps.